The City is a success story, the car has been the segment leader ever since it rolled out in India 16 years ago. The current fourth generation model also offers diesel power, making it the best selling car in the segment by a huge margin. Look at the number of new Citys on the roads today and you will agree. But what about the competition? Maruti Suzuki have always tried to challenge Honda by introducing a more affordable sedan but the last two attempts never really worked for them. 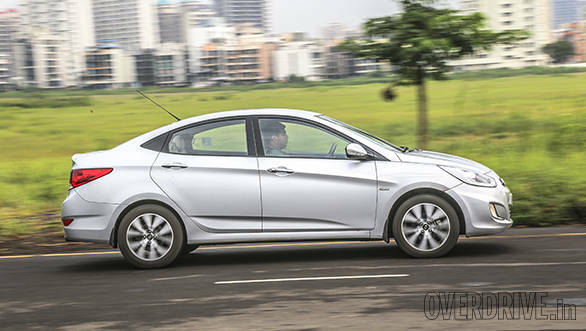 In fact Hyundai has been a bigger threat to Honda, the Verna being the nemesis. Maruti may have been busy introducing a new hatchback every year but it seems they have not given up on the C-segment. While the new City and Verna rolled out, the nation's largest carmaker went back to the drawing board and are now back with the Ciaz. Welcome then to the most important test of the year. All three cars here are distinctive, good looking sedans. The Verna is the oldest of the lot but the fluidic design has been one of the main reasons for the car's success. Over time, there have been certain additions, like the attractive daytime-running lamps and unique diamond cut alloy wheels. But the overall silhouette has remained the same, the fast flowing lines and coupe-ish sloping roof are unique for a car in this segment and a contrast to the City and Ciaz that follow a more edgy approach. The previous Citys followed a simple three-box design, but the new generation model is a lot more angular and features a prominent shoulder line, look at the car from any angle and you know it's a busy design. The Ciaz in comparison is the newest car here but doesn't look like one. It's a hard decision to make when carmakers style their cars - design them too bland and nobody is interested, make it too loud and some tend to avoid the model. Maruti has tried to play the safe game with the Ciaz. It does follow the same design theme as the concept that was shown at the Auto Expo but is a lot more toned down, a smart design but not the most attractive here. The face is very different when compared to its Maruti siblings but the front grille gives the car a typical Suzuki look. The sides are flat and not in sync with the front and rear ends, the tail lamp design is very similar to the City but look at both cars in the flesh and you will be able to differentiate between the two. The inserts in the rear bumper are unnecessary but add some character. Like in the Ciaz concept and current rivals, there is a chrome strip running above the number plate but strangely is standard only in the top end ZDI+ variant. All said, the Ciaz is smart and has the potential to attract a lot of buyers for its styling. 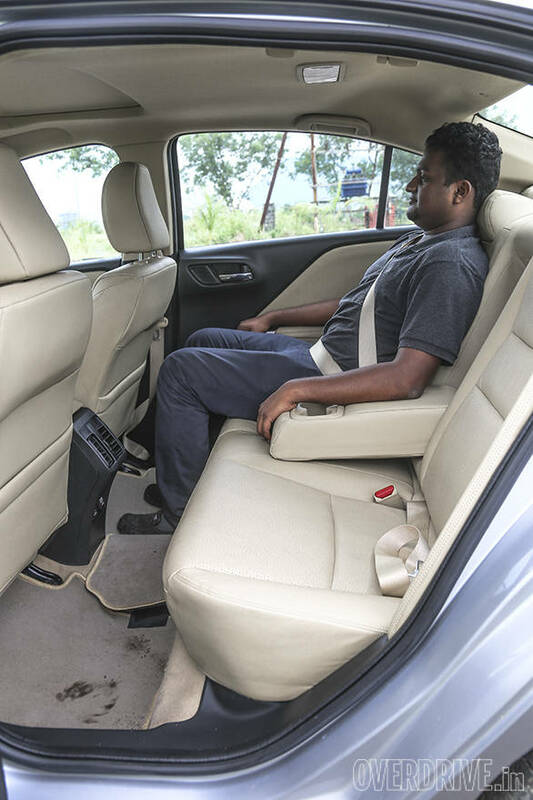 Step inside the Verna and unlike the exterior, the cabin isn't very appealing but the quality of materials used is still on par with the rest. 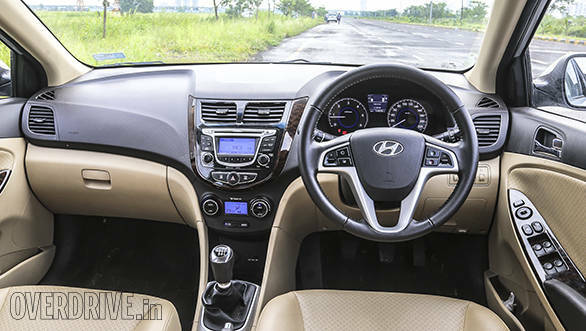 The darker shade of beige is not as elegant as the Ciaz or the City while the centre console and the basic small display stereo looks out of place. The City meanwhile follows a modern approach, the layout is clean while the piano black and silver inserts give the cabin a premium look. Even the AC controls are very different, it's a touch panel and is easy to use. The Ciaz interior fits between the Maruti and Honda. 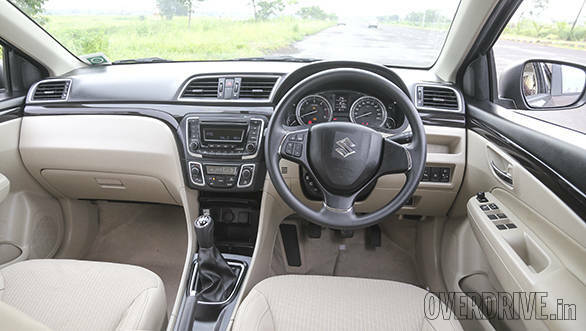 It is neither too bland nor too loud, it is more like an evolved Swift interior and even borrows a few switches and parts, which isn't a bad thing but Maruti could have used newer ones, considering the Ciaz is a more premium car. The steering wheel for instance is the same as in the Swift/Dzire but features some chrome detailing and Bluetooth telephony controls, it is good to grip though. The fog lamp and other dummy switches are however from the first generation Swift and look like a last minute addition. But how do they score in terms of space and comfort? Well the Ciaz is the largest car in the segment today, the footprint is almost D-segment like and so the maximum rear knee room is the best in class, even more than the already spacious City. However, both the City and Ciaz offer very similar useable knee room, the Verna has no say here and is the least roomy. 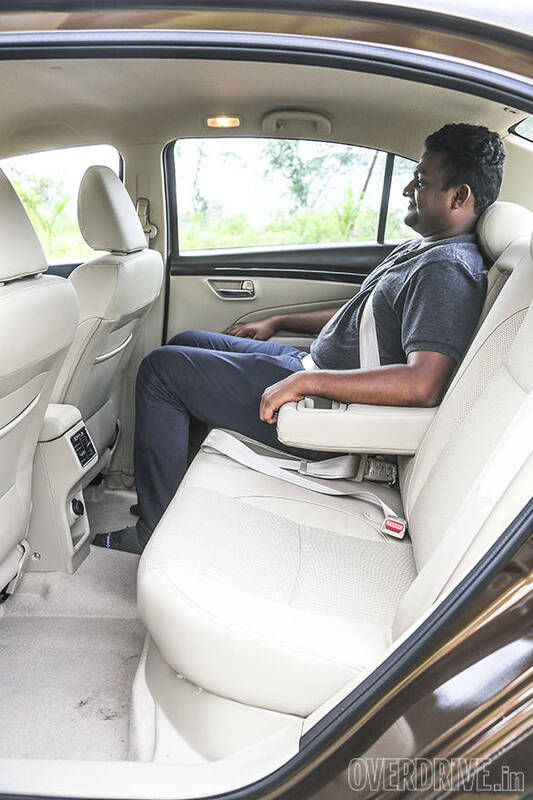 Move to the front, and the Honda and Hyundai are still more comfortable, the seats offer better cushioning than the Maruti. But when it comes to overall comfort, the Honda still finishes on top. The City maybe shorter in length but you get similar boot space as the Ciaz, 510 litres to be exact. The Verna in comparison only offers 465 litres. 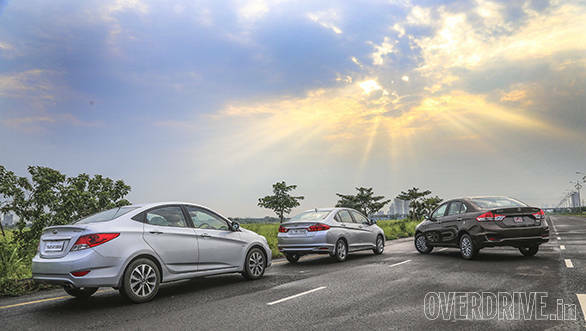 The diesel engines in these cars are all different capacities, the Ciaz uses a 1.3-litre engine, the City a 1.5l and the Verna, features a larger 1.6l unit. Max power and torque are as expected, the Verna tops the list followed by the City and then the Ciaz. 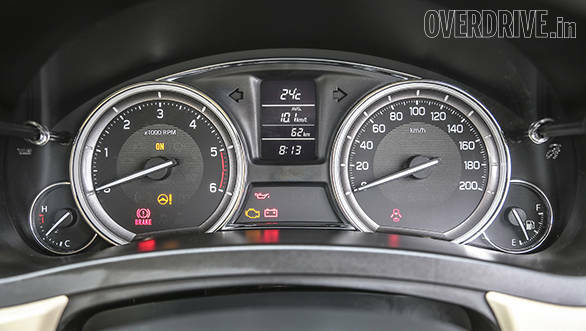 The Hyundai oil burner is also the most refined engine, it feels almost petrol like and it's disappointing that neither the Honda nor the Maruti come even close. But great power needs great boost too - the Verna displays the most turbo lag, so driving in bumper to bumper traffic is not as effortless as in the City and or the Ciaz. The latter uses the same engine that was used in its predecessor, the SX4 but finetuned for better driveability. There is hardly any lag and one can drive at slower speeds even in a higher gear. The City meanwhile, also produces power in a linear fashion but at the same time offers better mid-range power than the Ciaz. 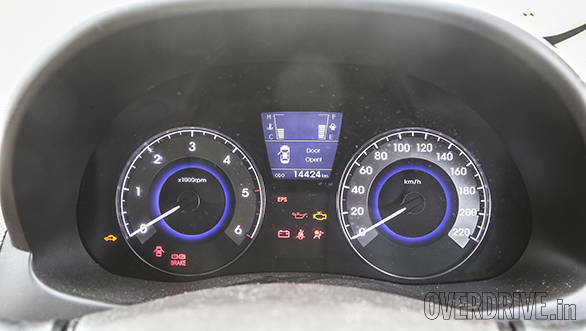 Gear shifts are smoothest in the Hyundai but the Honda and Maruti offer positive shifts. In terms of performance, the Verna is the quickest and fastest. The car maxes out at 188kmph while 100kmph comes up in just 10.62 seconds. This also makes it the quickest car in the segment. Roll-on figures despite the turbo lag are still best on paper but as mentioned earlier, driveability takes a beating. So the Hyundai is most powerful, but all of this comes at the cost of efficiency, the most the car can return in town and on the highway is 12.42kmpl and 23.67kmpl respectively. This translates to 15.22kmpl overall. The City, meanwhile, offers decent performance but better fuel efficiency - the dash to 100kmph comes up in 12.8 seconds and the car returns 15.5kmpl in town and 24.1kmpl on the highway, so the overall figure is a much higher 17.65kmpl. The Verna is quicker off the line but the City returns more miles per litre. When the Verna was updated earlier this year, the concerns with the soft suspension setup and lifeless steering system were addressed. However, it still is the least involving car to drive. There is more weight added to the steering but you're aware of the assistance being artificially added. The self centring system also takes time to get used to. The suspension crashes into potholes and the ride can get very bouncy on undulated roads at higher speed. Dynamics is definitely the Verna's weak spot. Maruti's rivals to the Honda City in the past have always had an edge when it comes to handling, The Ciaz however loses out this time. There is not as much feedback from the steering and handling is only neutral despite featuring a wider track and better tyres. The City is definitely not the best handling car in the segment but is more interesting to drive than the Ciaz. It feels a lot more agile too. If it wasn't under-tyred, the City would have offered even better grip. The Maruti, however, rides better, the suspension absorbs bumps and potholes without complaint and the cabin is quieter, ideal also for those who are chauffeur driven. It was the Hyundai Verna that first introduced a long list of comfort and safety features to this segment. Today, thanks to the Korean carmaker, both the City and the Ciaz now offer an even longer list. While the top-end City offers a sunroof, the Ciaz offers a touchscreen infotainment system that also features navigation. All cars, in their top end trims, offer keyless ignition and entry and a reverse camera function, but the Honda display is larger and offers different zoom levels too. The Maruti is the only car that gets a rear sunshade and reading lamps while rear AC vents are standard both in the Ciaz and the City. 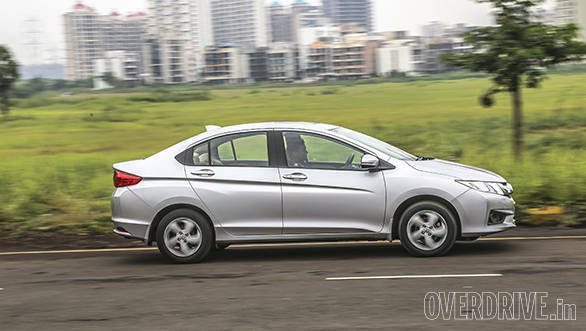 In terms of safety, even the base City and Verna diesels offer standard ABS and a driver airbag, while the equivalent Ciaz makes do without them. The top end Verna, in addition, also offers side airbags. 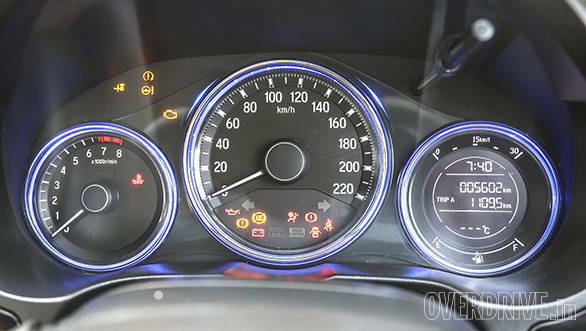 The Hyundai and Maruti top variants use projector lighting but the Honda sticks to conventional halogen bulbs. It's a close fight in terms of features, every car offering something unique. 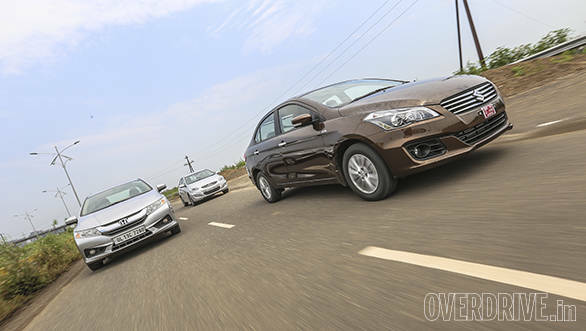 The base Ciaz however should have offered more standard safety features. The City was victorious when it last went up against the Verna. In today's battle, the latter loses out to the Ciaz. Apart from performance, the Korean is beaten in all other departments, and even costs a lakh more than the Maruti. 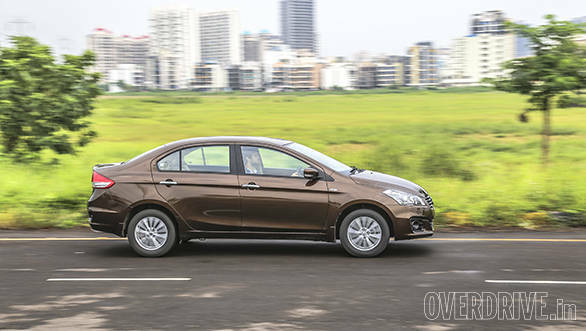 Is the Ciaz, then, a better car than the City? 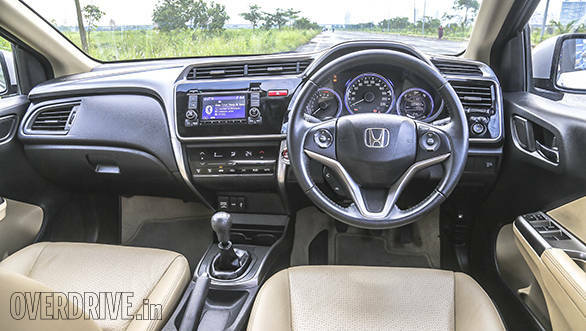 So far, every generation of the Honda City has been the best car in its segment. Maruti's previous attempts at the segment weren't really good enough to beat the City. The cars were priced lower but buyers didn't mind paying a premium for a better product. The Ciaz continues the tradition and is priced lower than the City (by more than a lakh) but unlike its predecessors, gives the Honda a very tough fight. The car comes close in terms of performance, is more efficient and is much larger too, as a result offering better cabin space. It even looks good, is as feature loaded and most importantly is backed by Maruti's wide service network. The City may still continue to sell high numbers but for the first time ever, the Maruti is the better overall package.